Information about your computer hardware and software when you use the Website. The information can include: your IP address, browser type, domain names, access times and referring website addresses. This information is used by Singapore Probate for the operation of the Services, to maintain quality of the Services, and to provide general statistics regarding use of the Website. Singapore Probate collects and uses your Personal Information to operate the Website and deliver the Services you have requested.Singapore Probate may also use your Personal Information to inform you of other products or services available from Singapore Probate and its affiliates, where you have consented to be contacted for such purposes. Singapore Probate may also contact you to conduct research about your opinion of current services or of potential new services that may be offered, although you do not have to respond to such surveys. Singapore Probate uses such information to maintain quality of the Services, and to provide general statistics regarding use of the Website. Singapore Probate does not sell, rent, lease, or release your Personal Information to third parties.Singapore Probate may, from time to time, contact you on behalf of external business partners about a particular offering that may be of interest to you. In those cases, your unique Personal Information is not transferred to the third party without your explicit consent. 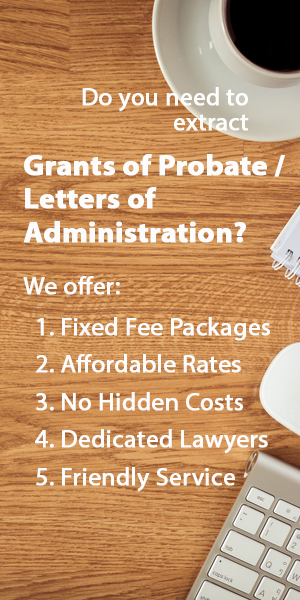 In addition, Singapore Probate may share data with trusted partners to help us perform statistical analysis, send you email or provide customer support. All such third parties are prohibited from using your personal information except to provide these services to Singapore Probate, and they are required to maintain the confidentiality of your Personal Information. Singapore Probate will disclose or share your Personal Information, without notice, only if required to do so by law or in the good faith belief that any such action is necessary to: (a) comply with any legal requirements or comply with legal process served on Singapore Probate or the Website; (b) protect and defend the rights or property ofSingapore Probate; and (c) act under exigent circumstances to protect the personal safety of users of the Website, or the general public. We may disclose your personal information to third parties: (a) in the event that we sell or buy any business or assets, in which case we may disclose your personal data to the prospective seller or buyer of such business or assets; and (b) if Singapore Probate or substantially all of its assets are acquired by a third party, in which case personal data held by it about its customers will be one of the transferred assets. Most Web browsers automatically accept cookies, but you can usually modify your browser setting to decline cookies if you prefer. If you choose to decline cookies, you may not be able to access all or parts of our Website or to fully experience the interactive features of the Singapore Probate services or websites you visit. We want to ensure that your Personal Information is accurate and up to date. If any of the information that you have provided to Singapore Probate changes, for example if you change your email address, name or contact number, please let us know the correct details by sending an email to contact@singaporeprobate.com. You may ask us, or we may ask you, to correct information you or we think is inaccurate, and you may also ask us to remove information which is inaccurate. You have the right to ask us not to collect, use, process, or disclose your Personal Information in any of the manner described herein. We will usually inform you (before collecting your Personal Information) if we intend to use your Personal Information for such purposes or if we intend to disclose your Personal Information to any third party for such purposes. You can give us notice of your intention to halt the collection, use, processing, or disclosure of your Personal Information at any time by contacting us at contact@singaporeprobate.com.